In 1877, Edison put all previous ideas and experiments with sound to the ultimate test in the invention of tinfoil recordings. By singing or playing in front of a large horn at a predetermined distance, a performer would produce sound that could be captured via a diaphragm attached to a stylus. When the diaphragm was stimulated by the vibration of sound waves, the resulting motion caused the stylus to come down on a piece of tinfoil wrapped around a cylindrical mandrel, which, with the help of a human-powered crank, would then create a series of indentations—in essence, a tinfoil record. Despite the tinny quality of these recordings (pun intended! ), the records and the phonograph on which they played flourished briefly in the late 1870s as an entertainment device. They were novel enough, in fact, that Edison purportedly was granted an audience with President Rutherford B. Hayes to demonstrate his newfangled contraption. Yet as any user of ordinary kitchen foil knows, the medium has serious longevity problems. The recordings could be played only a few times before the indentations made by the sound on the tinfoil were so flattened down as to be unplayable. Alas, none of the few existing tinfoil recordings have been successfully transferred to modern media. 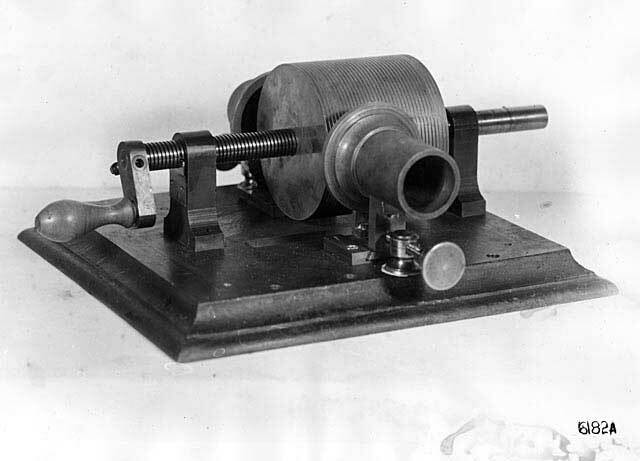 Nonetheless, the basic design of Edison's tinfoil phonograph changed little over time. It was changes in the physical medium itself that would ultimately exert the most long-lasting effects on the evolution of American sound recording history.